Sometimes you just get too much choice when you want to catch a bus. I have realised recently that there is an extra 50 leaving Derriford Hospital at around 17:10 which is a double decker. This brings out the anorak in me so I have started to leave work a bit earlier to try and catch it as I prefer the Volvo's to the plastic Darts any day, Because this run is an extra bus it does often follow a standard low floor Dart on the 50 run anyway. This means I have to let the single deck 50 go by and then hopefully flag down the double decker - one more than one occasion the single decker has pulled up to the stop and the double decker has overtaken. Tonight there was really heavy traffic around Derriford so I expected a bit of fun - I was at the bus stop watching three 50s all following each other coming towards me. This time there was a bit of a gap between them so i let the two Darts go by and managed to get the proper bus to stop. Driver was amused I had let the Darts go by but understood my preference for real buses. We then followed in typical leap frog fashion with all three 50's in convoy. Each having a fair load of passengers but they could all have fitted onto the one double decker. Having arrived home in style and having a joke with the driver about the situation I was even more surprised to find another 50 right behind us. These four 50's will then have travelled all the way into town in convoy. Great fun for me - but surely there must have been a lot of passengers getting cross tonight as somewhere there must have been a 45 minute gap in the service at least! I know what you mean-I always prefer it when a Volvo Olympian arrives instead of the rattly Tridents that usually do the route. 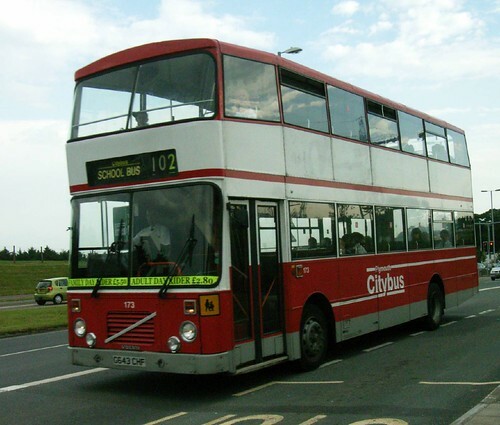 Also the Volvo's can make it up the steep hill that is part of the 13, 13A and X13 routes that all go to Haverhill through different villages along the way. The Tridents slow from 50 to about 15-20 up the hill whereas the Volvo's just cruise straight up and then touch 70 mph back down the other side, and keep thet speed up until the roadworks which don't need to be there.